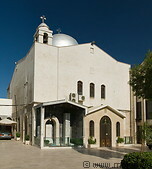 The Armenian Apostolic Orthodox church lies in the eastern part of old Damascus, close to the eastern walls. It is recognisable by its silver-coloured dome. The church is open for tourists.